Mounting Pads | Cable Tie Mounting Pads | Cal Fasteners, Inc.
Cal Fasteners offers rubber mounting pads designed to save time in cable tie clinching. Special tabs keep cable tie heads from sliding behind bundled wires or cables during vertical installation, and help maintain proper placement in horizontal applications. Lead-in funnels help position cable ties for easy insertion, and countersunk screw holes let cable ties pass easily over screw heads. Four side entry and centered screw holes make positioning fast and easy. 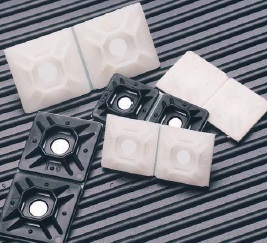 These mounting pads are manufactured from high quality nylon materials in black and natural. Rubber adhesive, acrylic adhesive, and adhesive-free versions are available in multiple sizes. ROHS compliant. To help keep your mounting pads in place, Cal Fasteners also offers mounting pad adhesive. Request a quote on the mounting pads you need, or contact us to learn more.